In Salt Lake City, more than 640 pounds of turkey and nonperishable items were collected during the two-week drive, which ran from November 1 to 15. Locally, the Thanksgiving Drive benefitted Utah Food Bank, a nonprofit organization which collects and distributes food to more than 140 partner agencies across 29 counties in Utah. David Weekley team members delivered the collected items to Utah Food Bank to distribute to families in time for the holiday. Utah Food Bank is a nonprofit committed to partnering with volunteers and the community to make an impact and fulfill its mission of Fighting Hunger Statewide. In 2016, the organization distributed more than 30 million meals to 141 partner agencies across 29 counties. In addition to collecting and dispersing food donations, Utah Food Bank provides direct service programs. 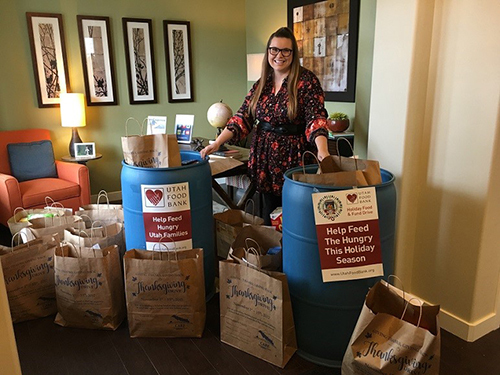 Team members from David Weekley Homes donated 640 pounds of nonperishable and food items to Utah Food Bank to benefit families in need.